I desire to pause here to pay just tribute to the memory of that man who organized the army which will yet win victory for Britain and for the allied nations; I mean Lord Kitchener. To his standing as a great soldier, as the virtual head of the British army at the time; to his military ability, to his indomitable will, which had been tested on so many occasions, the people of the United Kingdom and the whole Empire looked in the day of trial, and they did not look in vain. On 5 June 1916, while transporting British War Minister, Field Marshal Horatio Herbert Kitchener, on a diplomatic mission to Russia, the HMS Hampshire struck a German mine near the Orkney Islands. Earl Kitchener and his staff drowned in the violent sea along with 643 crew and passengers. 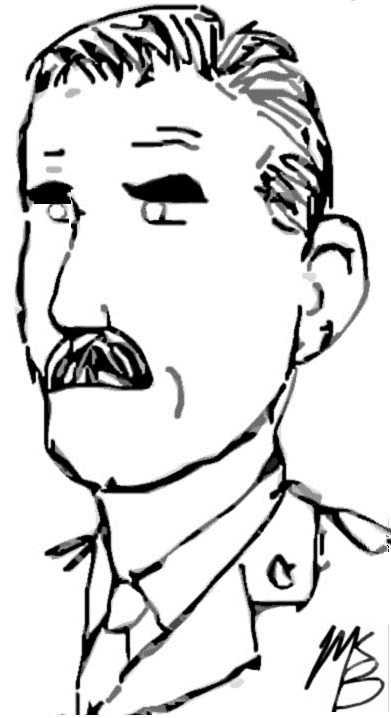 One day later, the 244th Battalion was authorized from Montreal under the command of Frederick Mackenzie McRobie. 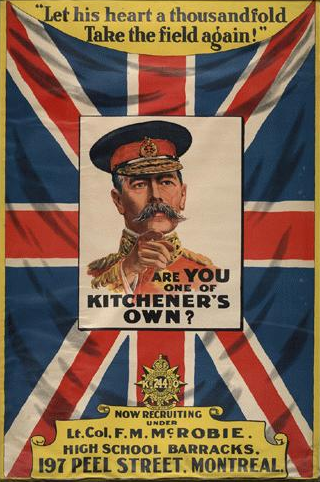 Sir Sam Hughes dubbed the new unit Kitchener’s Own and called on recruits to avenge the War Minister’s death. Born on 9 April 1875 in Montreal, McRobie was founder and general manager of a taxi and baggage company. He had become commanding officer of the 3rd Victoria Rifles in 1915 after most of the senior militia officers left to serve overseas in the early years of the war. A former amateur hockey executive, McRobie helped to organize a battalion team for the 1916/1917 in the Montreal City Hockey League. The club finished in last place with a record of 2-7-1. Frustrated with slow recruitment, district General E. W. Wilson complained, “We have enough men at the hockey matches and theatres every night to fill these two battalions (244th and 245th), and half a dozen more.” The 244th sailed for England in April 1916 with just over 600 volunteers. The troops were absorbed into the 23rd Reserve Battalion. McRobie later served with the Forestry Corps. After the war, he founded the Montreal Tourist and Convention Bureau and promoted investment in the city’s tourism industry. He died in Montreal on 1 November 1961.